Heat oven to 350. Cut each tortilla into 8 wedges, like a pie. Place in large bowl. Drizzle with oil and salt. Using tongs, coat each wedge with the oil and salt. Place the wedges carefully on two baking sheets (you don't want them stacked on top of each other), and place them in the over for 15-20 minutes, or until golden brown and crispy. I like that these are baked instead of deep fried. Definitely healthier. Oh I could so easily munch on these! Ooooh need to try this! I love making homemade tortilla chips! They're so much tastier and I love how crispy they get. These look fantastic. I adore baked tortilla chips! haha trendy tortilla fail ;) I'm a good old fashioned flour tortilla girl too! These chips look fantastic, like a pita chip but not. Awesome! I will share on my blog under the recipe for people to know where to find nice and crunchy chips to dip in it! Haha. I would totally try the spinach tortillas too. These are gorgeous chips - I'm so happy they're baked. they look crispy and delicious!I would love some with guacamole! i actually did a search the other day for homemade tortilla chips. so great! These look amazing! Yesterday I cooked some mexican food and still have some guacamole: perfect with your wonderful chips! 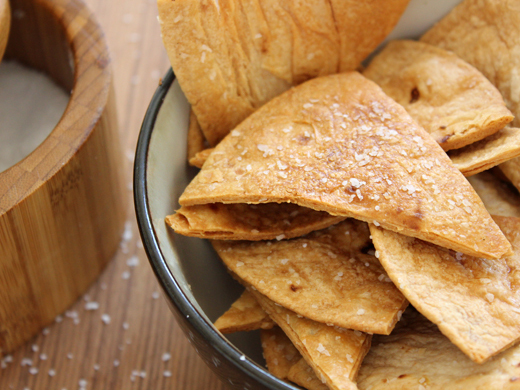 We love making our own homemade tortilla chips! They are so good! I love Mission's flour tortillas, so I'll definitely give their corn ones a try! Homemade chips are the best! They look yummy! These sound delicious. I like that they are baked. I love making these as well - tasty and delicious! Thanks for sharing this post and glad you made it to the post. I know that tortilla chips were made of leftover tortillas at restaurants and wondered if we can do it in the oven. We always have leftover tortillas that sometimes end up in the compost. I will give this a try for sure! I always say I'm going to make my own, but for some reason I never do. They are so easy and they look delicious, I AM going to make them! Ooo Im seriously making these tonight! I have those exact tortillas in my pantry already and some homemade hummus in the fridge (I've been obsessed with tortilla chips and hummus lately!). Looks awesome! I make tortilla chips in the same way....baking them produces such good results and they keep well for a pretty long time as well! These look absoloutely delicious! I have some in the oven, right now! Yum! Delicious and healthy way to snack.